Chrysogonum virginianum is a eastern US native known for both it's foliage and flowers. Chrysogonum virginianum is a long blooming, great little native Asteraceae ground-cover with semi-evergreen foliage and golden flowers. You'll find it happiest in woodland gardens that have good drainage and base soil. Naturally occurring plants are found in bright filtered light along forest edges and clearings. Expect it to be vigorous, it is after all a ground cover. It's been in my garden for at least a decade and is very much at home between the large stepping stones on the path to the front door and in the adjacent bed. It flowers every spring and doesn't seem to mind a bit of foot traffic every now and then. Green and Gold blooms early in my Zone 6b/7a garden; a few flowers will open in mid-March, but, April is when it pops. Then all at once the small golden flowers are waving above the green fuzzy leaves as if they're saying come on pollinators here I am. The early bloom provides nectar for visiting bees and butterflies. Chrysogonum virginianum is not just another yellow composite flower. It's a charmer that wends its way through native sedges, huecheras, Spigelia marilandica, ferns and mayapples. It can dance with Phlox pilosa or ramble over a small boulder. 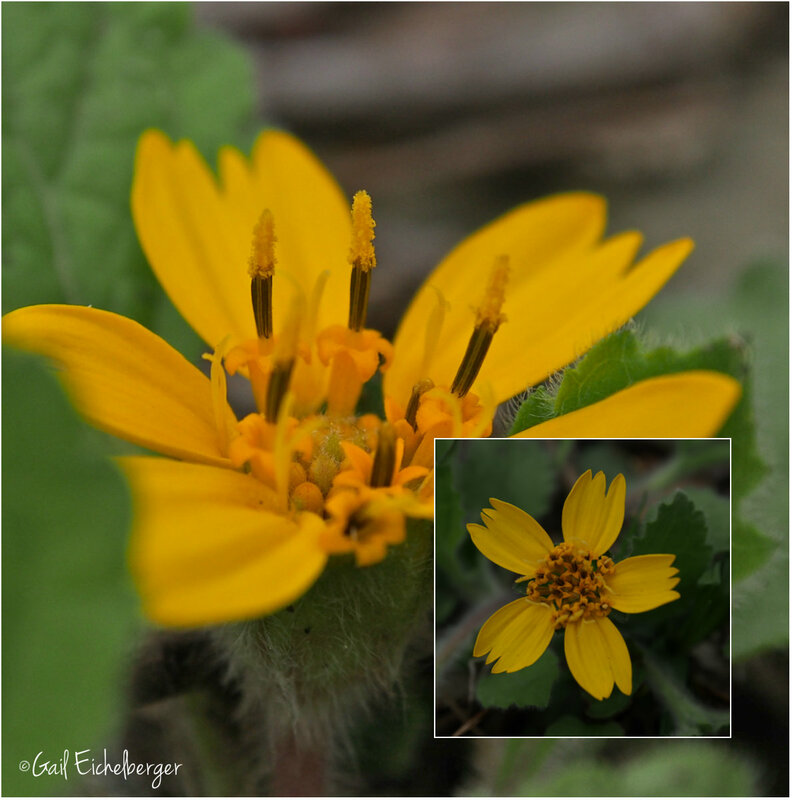 The golden star flowers have five slightly-notched, yellow petals and a center of yellow disk flowers. The bright green leaves are ovate, with crenate (rounded teeth) margins. The leaves, stems and stolons are quite hairy or fuzzy. I recommend Green and Gold as an alternative for invasive thugs like Winter creeper (Eonymous fortunai), Creeping Jenny (Lysimachia nummularia) and Vinca minor. I wish big box stores and independent garden centers sold it instead of non-native thugs. Having mentioned thuggishness, please, remember, this native is a ground cover, so don't expect it to stay put, it will travel. Good reasons to consider planting Green and Gold in your garden. Bloom Time: Late March, April, May and possible rebloom in the fall. If you're gardening in its northern zone you might have summer blooms, but it's too hot in Middle TN to bloom all summer. In a wet, cool autumn there might be repeat blooms. Sun: Part shade to full shade. If you want to plant it in the sun make sure it is well watered during dry summers. Water: Medium with good drainage. Once it's established it should be fairly drought tolerant. Companion planting: Dwarf crested iris (Iris cristata), Blue wood sedge (Carex flaccosperma), Christmas Fern (Polystichum acrostichoides), Hairy Alumroot (Heuchera villosa), Ohio spiderwort (Tradescantia ohiensis and Blue-stem goldenrod (Solidago caesia)or what ever combination of plants that need a spot of golden star beauty. Even though it's a spring bloomer Green and Gold is an honorary member of the Clay and Limestone Rough and Tumble Wildflower club! Take a chance on Golden star, I've never regretted planting it. I would love a start of this wildflower. I have some area I bet it would love. I saw my first bee yesterday. Such an exciting time of the year. Hi Gail, I've never heard of this one. I see it is not one that is native to our area. I agree with you, it is much better for a native spreader than the non-native aggressive plants. Thanks for introducing me to yet another native beauty, Gail. If I can find a source for them, I have the perfect place for them where I'd be happy to have them travel to their heart's content. Unfortunately your golden star is not one that would grow here in Texas. It's cheery little flower looks so much like our chocolate daisy. I wish that one would spread a little. It's a mystery to me! Any thoughts/advice? I don't know...is your soil to acidic or maybe to wet in winter. Good luck with it. Great little flower. I think it would like my stepping stones too. This is a beautiful wildflower and I noticed that it has a long bloom time. Lovely! I took the easy way out this month and did a wordless wildflower post. The Maple flowers are so magical right now as we move from winter to spring. Thanks for hosting this meme. Now that's a pretty little thing! I saw my first bee yesterday, so I know things are perking up outside! Your golden star is beautiful. It reminds me of our Englemann's daisy and a few other Texas natives that are blooming right now. I put mine in a vase today. See if you can name them all! I planted 'Eco Lacquered Spider' nearly 20 years ago and it has spread at least tenfold with little care. It's in filtered sunlight in a place that gets very dry and is occasionally under water. It pairs beautifully with purple flowers like dwarf crested iris, violets and verbena. I really should put in some other places in the garden! I love the idea of planting it between step stones. Another reason to plant Green and Gold - they are the colors of our football team Green Bay Packers - Yeah! Finally joining in...I love this plant, but will have to try again as mine disappeared when it was swallowed by horsetail. Just moved and divided mine that were underneath a Carolina Allspice that was starting to tower over them. Very easy peasy to do. There are no native plants blooming at this time of year, but many invasive plants are showing signs of life. This is the perfect time of year to pull bush honeysuckle up by the roots, which is what I do with the small ones. Then there's more area for the natives to grow in.